2017 was a busy year at International Social Service, USA! 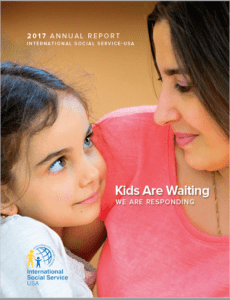 In 2017, ISS-USA opened 894 cases, provided social work and legal training for over 1,500 professionals, and connected 1,150 children and adults to social services all over the World. View our 2017 Annual Report: Kids Are Waiting, We are Responding, and learn more about our productive year.